Ultraviolet (UV) light is a natural disinfectant. It destroys bacteria that it comes in contact with. 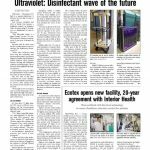 Paul Jewison, president and CEO of Textile Care Services, a healthcare laundry in Rochester, Minn., has been using UV technology as a disinfectant for close to two years. However, only in recent years has the laundry industry begun to embrace the disinfecting properties of UV.